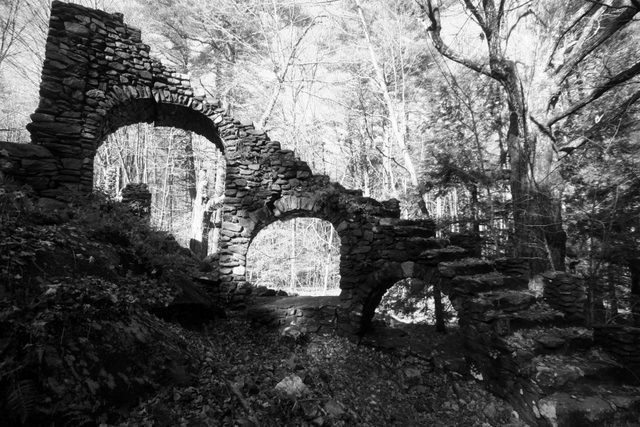 Deep inside a picturesque wood in the heart of Chesire New Hampshire, there emerges from the leafy and soft floor, a series of dark stone structures in vaguely familiar forms of a house’s foundation and it’s tri-arched, spiral staircase. The maliciously assembled dark stone work blithely intrudes on the forest’s natural colors, creating an eerie scene of misplaced labors and colors. It is almost as if the two forces are battling for aesthetic dominance, with the forest slowly usurping what is left of a mighty castle. Its ominous in every sense. On dark nights with just enough moonlight, they say, at the top of the spiral staircase a spectral figure of a young women will appear, slowly descending the staircase, accompanied by the soft sounds of laughter and music. Her name is Madame Sherri and many believe she haunts the castle she once built. 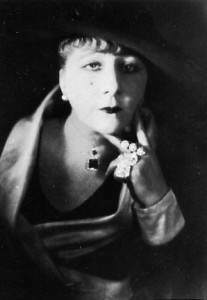 Sadly, in 1927, just sixteens years after their marriage, Andre died possibly from the toxicity of bootlegged alcohol or syphilis. Left alone after his death, Sherri continued about her eccentric life.Two years later, she purchased a small farmhouse on the side of Rattlesnake Mountain and began buying up adjoining acreage, fueling her second love: the forest just off Gulf Road in Cheshire, New Hampshire. Sherri would live in the small farmhouse devoid of many modern amenities for seventeen years. 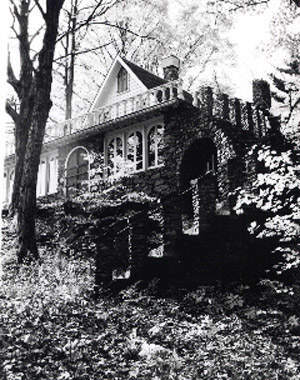 But, the farmhouse would not due for hosting and she set her sights on building a castle in the middle of the woods. During the turbulent construction period, where she reportedly beggared many of the contractors about minor details until they quit, rumors began to circulate about her. It was said that she would be chauffeured around town in a cream colored Packard with nothing on but a fur coat and accompanied by her pet monkey. It was also said that the madame in her name was there for literal reasons. In spite of her detail focus and her offbeat way, they managed to finish the entire castle in the woods. 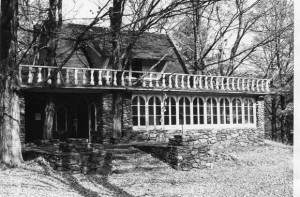 Upon its completion one of the visitors, As Lynne Borofsky said,“It was a theatrical French chateau of New Hampshire stone, wreathed in Roman arches and crowned with a chalet roof. An imposing stone staircase—grand enough for a Follies stage set … had stone flower boxes with red and white flowers earning the name ‘Primrose Path’. The main stairs, cut into the rock ledge, leading to a massive RED front door.” Adding to the atmosphere, there was even suppose to be a tree growing through the center of the house and out of the roof. And Sherri entertained, a lot. It was rumored that she had swinging parties inviting all sorts of guests and celebrities from New York and hiring electric bands to provide entertainment. But, the fun ended only a few years after it began as Sherri’s money simply dried up. It was not long before she was a ward of the state, leaving her palace in the woods to succumb to nature. With no one to take care of it, the castle soon became a constant victim of vandalism until it caught fire in in 1962, just three years before Sherri herself past. The fire ripped away the walls and roof of the castle but left the stone foundation in place which still stands there today. More interestingly, though, is that many report that it does not stand alone, still run by Madame Sherri at the top of the spiral staircase and still punctuated by the noises of her parties. This intrigue no doubt makes Madame Sherri’s woods a place to stop and explore or experience under the stars.